John Sturges’ 1960 Western The Magnificent Seven has long been one of the most beloved examples of the genre. Its highbrow pedigree extends from its source material (Akira Kurosawa’s The Seven Samurai) to a killer cast that includes Yul Brynner, Eli Wallach, Steve McQueen, Charles Bronson, Robert Vaughn, and James Coburn. You’d have to be a fool to remake such a well-regarded classic, and Hollywood has found such a fool in Antoine Fuqua, who is remaking the film with his Training Day star Denzel Washington. 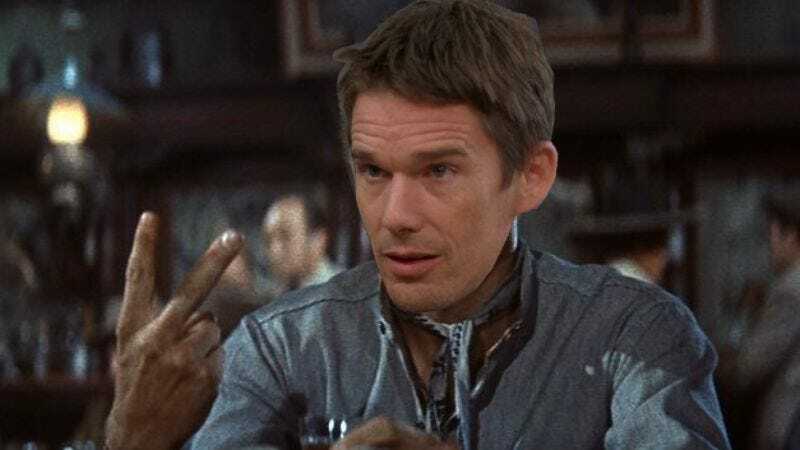 Fuqua is now doubling down on that strategy, as he’s added his other Training Day star, Ethan Hawke, to the cast. Hawke presumably plays the mumbling slacker gunslinger who doesn’t take his village-protecting responsibilities seriously. Chris Pratt will also be fulfilling his obligation to appear in every movie, and will be playing Dinosaur Wrasslin’ Spaceman Indiana Jones (the role played by James Coburn in the original). Another past Denzel costar, Haley Bennett (The Equalizer), will also be on hand in an unspecified role. Knowing Hollywood, she’ll probably play one of the Mexican villagers who enlists seven gunslingers to protect her town, but we suppose anything’s possible.